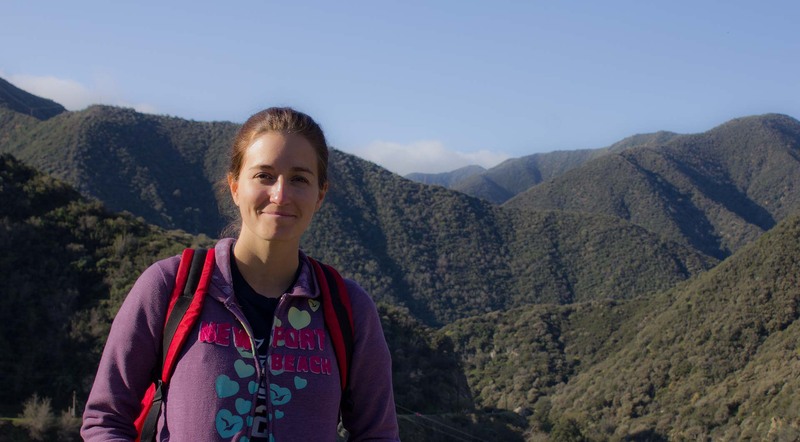 In the last few years, I’ve participated in the most extreme adventures that I could imagine. Even my wedding day included a little bit of rock climbing and a trip up the trapeze ladder to swing my way into married life. You may have a different opinion of what constitutes an extreme adventure, but I’ve narrowed it down to my top 5 based on sheer fear, nervousness, excitement, and potential to crap my own pants. 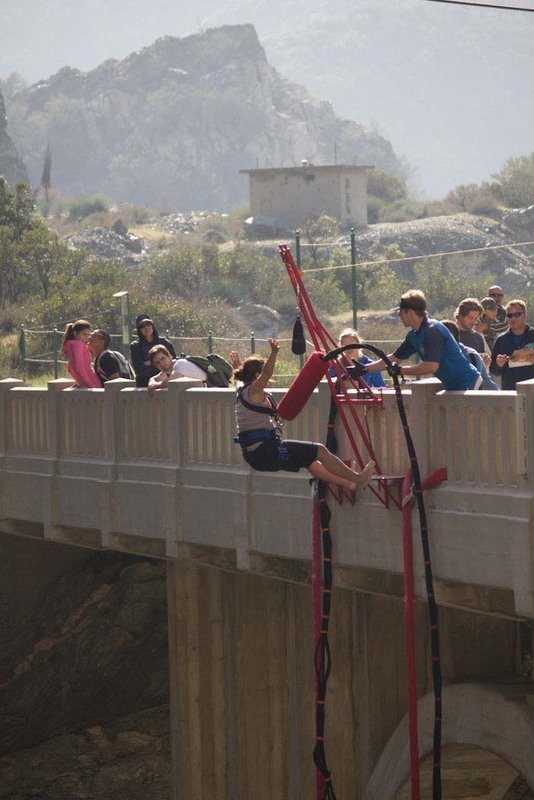 Plunging into the number two spot is bungee jumping! 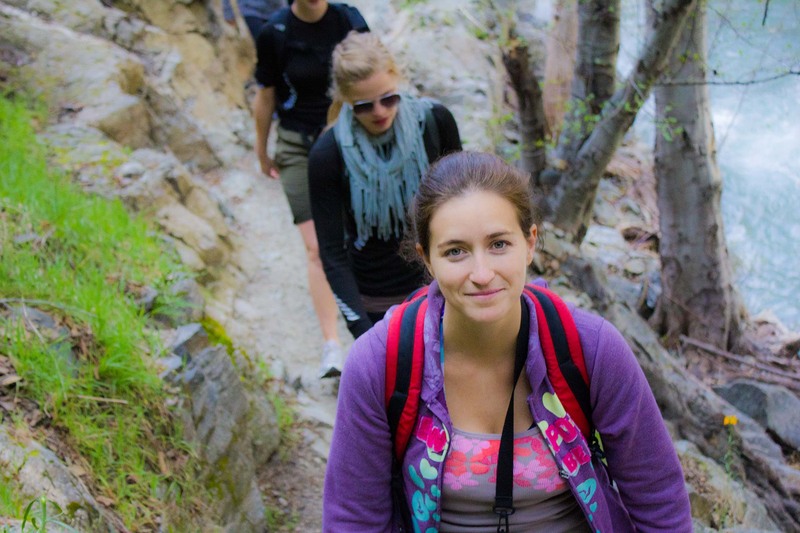 Set deep in the San Gabriel Canyon, all guests meet at 7:30 am for a 5 mile hike over a rocky, rough trail that leads to the Bridge to Nowhere. The trail crosses a creek 6 times in up to three feet of water. This part of the journey alone is not for the faint at heart, but what awaits at the end of the trail is one of the most exhilarating, adrenaline pumping activities in the world: bungee jumping. The five mile hike out was conquered at an impressive speed. My adrenaline acted like a drug and I knew that bungee jumping would forever hold a spot in my top five extreme adventures. 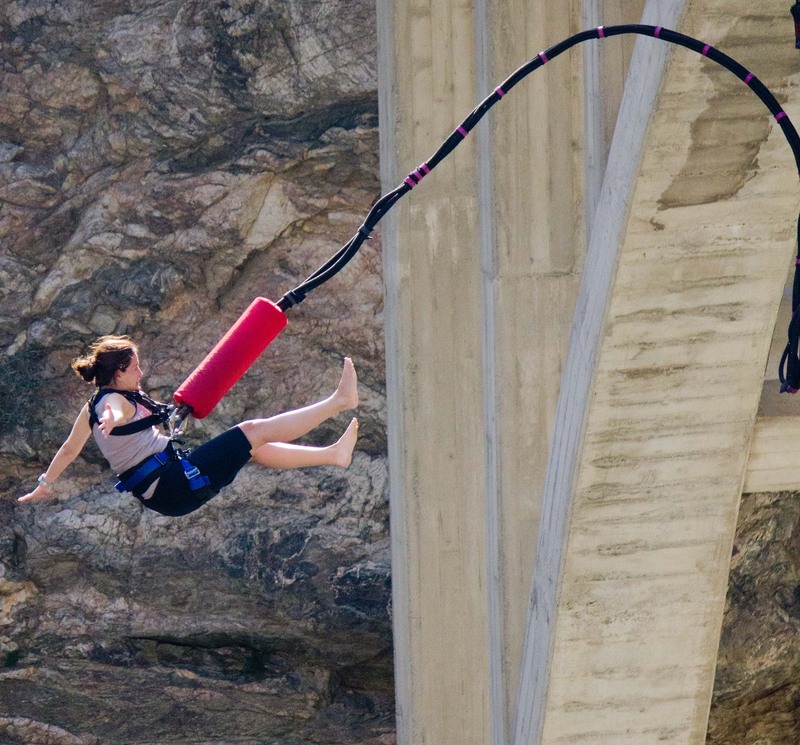 This entry was posted in Adrenaline, Adventure, California, California Outdoors, Travel, Uncategorized, USA and tagged Adrenaline, adventure, Bungee Jumping, California, extreme, extreme adventure, landscape, Lesley Carter, photo, photography, SoCal, southern California, travel, travel magazine, USA, vacation by lesleycarter. Bookmark the permalink. So, when are you going to go free swimming off of South Africa’s great white shark infested waters with no cage or other protective gear? (I wouldn’t do it now, maybe 15 – 20 years ago tho!) – some feats that are man-made are just exercises in scaring yourself [email protected]#$less, but attacking nature mano-a-mano is another thing altogether… maybe go camping with grizzly bears in northern BC? Great stories, always look forward to them! I lived in northern Canada for two years so I’m more familiar with bears. Not in a million years could I do that…glad you had fun though! The hardest part is getting there. Once you’re on the ledge, you just turn your mind off, listen to the count down, and mindlessly jump! It is an amazing feeling. What is your most extreme adventure? I was supposed to be doing this in June, but unfortunately, the place we were going to jump from, Navajo Bridge, is, for the current moment, off-limits. Oh well. Someday. I hope you get to experience this soon! It’s a life changing experience. What are some of your other extreme adventures? Well, I have climbed a ton of mountains and rocks, kayaked and rafted, jumped off high bridges (sometimes at night) into deep water, but that’s about it. I have to say that your blog has really inspired me Lesley, I have been pretty fixated on climbing but your posts really make me want to do more and more! You’re right about the walk before hand. It’s five miles to think about the amazingly unnatural thing that you’re about to do. That was the hardest part. It’s fun to vicariously experience these crazy things – ‘cos I ain’t never going to be leaping off-of nothin’. Good for you. Not so sure I could do that….. You make it sound like a great thing to do though!!! Very cool – not sure if I have the guts, but I like the harness system you used better than the one around the feet. Have you tried both? I am guessing the harness system is easier on the body! I did try both. I did the foot jump in Switzerland and I actually preferred it that way. Honestly, I did hurt my neck a little on this jump at the Bridge to Nowhere and I don’t think I would jump that way again. One of these days I will do this. WE have centre here on Vancouver Island (Nanaimo). There are no excuses for me. P.S .Lesley, did my blog site ever get listed on your Friends site? Vicariously experiencing these adventures – thank you. I think I would pee myself since I am not a big fan of heights and like a little control too – ha! Happy Monday! How cool is that! I would LOVE to cross off more adventures like this on my “to-do” list! What are some adventures you’d really like to do? For starters I have always wanted to dive/swim with Great White Sharks; I’ve wanted to zip line through a jungle; and I’ve always wanted to complete some sort of adventure hike or trek! Vicariously experiencing these adventures – thank you. The only really thrill seeking stuff I do is in my head! EEEEk, I’m a geek. No can do anything like that. Hi – can’t seem to get my message through, so sorry if it repeats. I haven’t done any bungee jumping yet – and I’m thinking it’s not likely now – but you sure make it look like a great experience. My hands are sweating just looking at those pictures! Jeeze! Wow, what an adventure! The pictures are over the top. It was a thrilling read. I wanted to thank you for visiting my blog and liking my post. I am honored. You have a great blog! That looks horrifying….but glad you had fun! 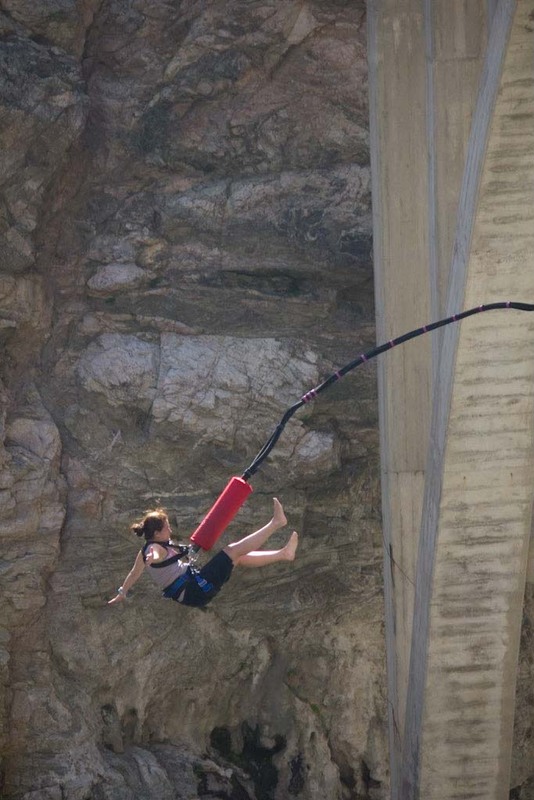 I bungee jumped in New Zealand and it was crazy, mind-numbingly terrifying, but also exhilarating. I don’t think I’ll ever do it again, but it was a great rush! I’ve bungee jumped as well and would also count it as an extreme adventure that serves as an incredible thrill and shakes fear right out of you. Great post. WOW, I wanna try this out but I guess I should have the nerves to do this. 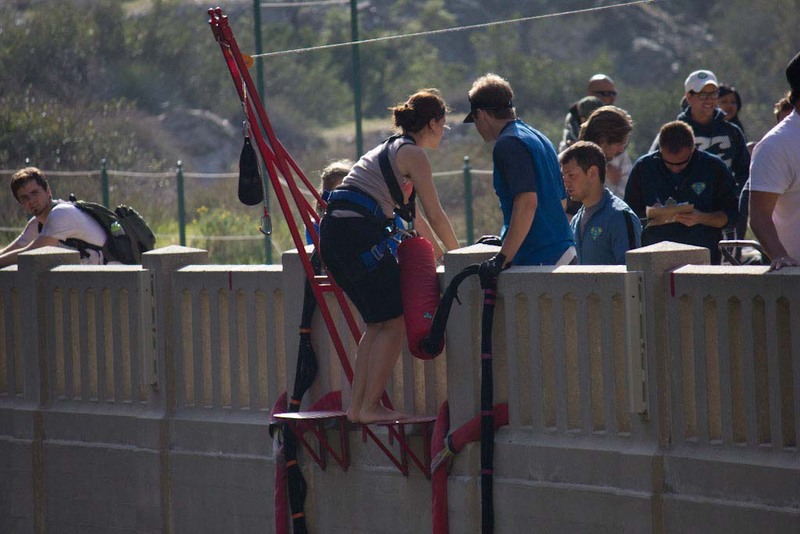 Bungee Jumping is so much cool. Once I did jump of from the alexander tower in berlin. I also jumbed some more often from some Bungee Jumping Cranes. But jumping off from the Alex in Berlin was defenetly a higlight and not comparable to jumping of from a Crane. As the Alex is really high. But I never jumped of from a Bridge. That looks fun too! Good on you Girl, I did one years ago in NZ, great fun. It’s interesting that you went down backwards. I think that would be harder on one’s spine than front/head first as I did. I was pretty scared but enjoyed it once I finally got off the tower. Impressive scenery you had. Wonder if anyone’s ever put a video camera on their helmet so that it records the jump from their perspective? That would make for some interesting footage. You are a brave gal!! you’re a dring woman and I admire you! I wish I had your gusto! Many of you have commented that you’ve done something equally as adventurous or thrilling and I’d love to hear about it. Please feel free to send your stories this way at: http://www.bucketlistpublications.com/submissions/. I’ll happily review them and publish the ones that fit with the goals of Bucket List Publications. Thanks for reading and taking the time to comment; it’s appreciated. Wow, awesome! I really wish I was one of these kind of girls who would do these incredibly scary things! But unfortunately I’m a chicken.. Great photos. Good for you! Our humans would never let us go. To be honest it looks a bit scary. Awesome photos! This is one of my top experiences too! You guys rocked it! NOT FOR ME….NOT NO HOW!! Enjoying reading about your adventures Lesley! 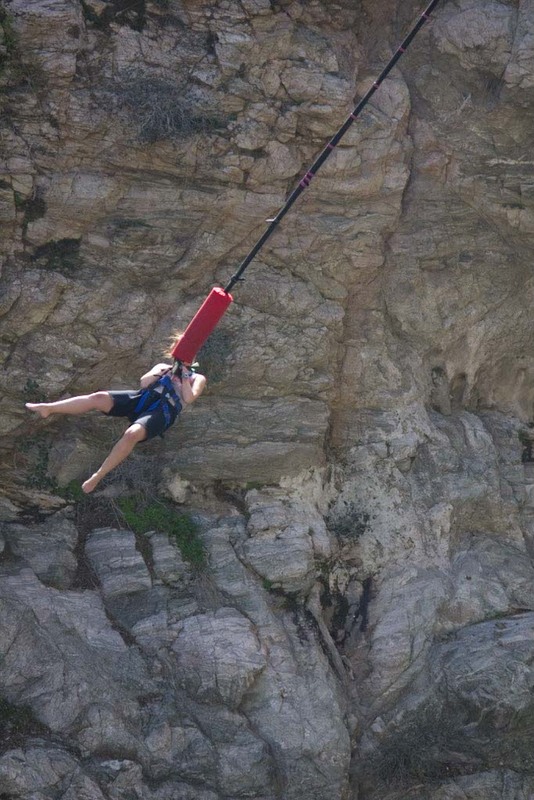 Especially this one, as bungee jumping as an extreme sport hails from where I am from, little ol’ New Zealand. I haven’t done it yet… You got great photos! Do you have any plans to do it again, maybe at the original spot where it first started to get big, in Queenstown NZ, off the Kawarau Bridge? Oh my goodness! I’m not surprised that you’d bungee jump. I could never have done that, not even in my younger years. It was fun reading about it! Thanks for sharing! It’s the scariest thing I’ve ever done! And you are so right, the adrenaline rush at the end is totally like a drug. That looks awesome! I want to try that lol. I just love your blog! Very inspiring and fun to read. My husband and I traveled around Australia, New Zealand and Asia. My favorite activity would have to be white water rafting without a doubt! 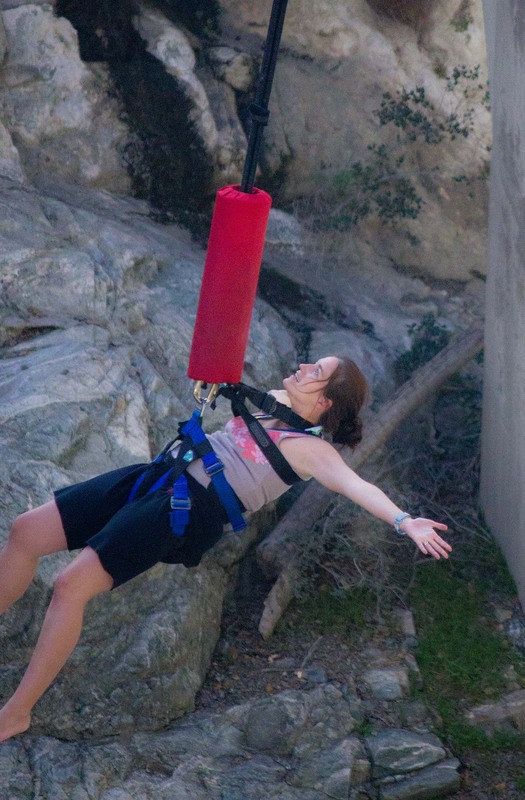 There’s nothing like flying straight down off a waterfall…except maybe bungee jumping. I’ve got to try it! nice description actually inspiring everyone to do it.That must have felt like absolute freedom. May god be blessing you with all that happiness. May the moment come into my life soon. ah-ah~no-no-no, but good for you! Much much braver than me!! I have a dream to try this….. Are there any good places to do it in the UK?! I have sky dived once and it was the most amazing experience of my life… Bungee is a dream I have had for 20 years….never too late?!?!!? its so much interesting matter.